TSN Toronto reporter Kristen Shilton checks in daily with news and notes on the Maple Leafs, who held a team meeting before facing the Buffalo Sabres at KeyBank Center Wednesday night. 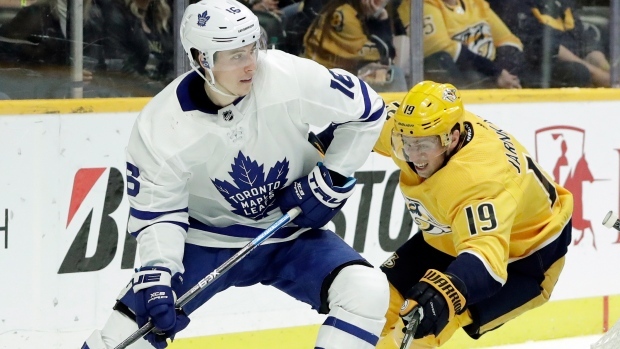 It’s rare that a losing effort can also be a beacon of light, but that’s exactly what Tuesday’s 3-0 loss to the Nashville Predators was for the Toronto Maple Leafs. After four straight games last week where Toronto was outscored 23-15 and went 1-3-0, the Leafs came away from Nashville having allowed their second-fewest shots on goal this season (20) and were buoyed by an overall improved defensive performance. Babcock revealed that defenceman Martin Marincin is still sick with the flu and won't play Wednesday against the Sabres, leaving the same lineup, save for Garret Sparks in net, as Tuesday's loss. But the Leafs’ bench boss also hinted there could be another tweak coming, but he won't make that call until warmups. John Tavares said after Tuesday’s defeat how positive it was that the Leafs were on a back-to-back, and would get to keep their momentum going immediately in Buffalo. His teammates concurred, and are holding fast to the notion that this slump will be beneficial in the longer term. All the smaller things Toronto did well in Nashville – limiting chances, playing tight through the neutral zone, breaking pucks out quickly – need to be carried forward now, but without impacting their offensive output. It’s a balancing act that the Leafs are running short on time to figure out with only nine regular season games left. In the aftermath of the Leafs’ 6-2 loss to the last-place Ottawa Senators on Saturday, Sparks called himself and his teammates out for “need[ing] more emotion” and saying they should “get angry" to help stop their current skid. It was a bold statement by Sparks, a backup who has appeared in only eight games since Christmas and posted a 2-6-0 record. Given Sparks generally only plays the second night of Toronto’s back-to-backs, he didn’t have to wait long for another chance between the pipes after last Saturday’s debacle, and all eyes will be on the netminder to see how he lives up to his word. While the other Leafs can appreciate Sparks is the type to “wear his heart on his sleeve” as Mitch Marner put it, they don’t necessarily agree there’s been a lack of emotion to their game. And becoming angrier may not even help the Leafs anyway, especially if it distracts them from the bigger focuses on the ice. The last time Alex Nylander stood opposite his brother William in a game, it was April 3, 2017, and the younger Nylander was making his NHL debut. In the nearly two years since then, Alex has honed his craft primarily with the American Hockey League’s Rochester Americans, while William became an integral part of the Leafs’ offence and went through a highly publicized contract dispute with the team last fall. Regardless of how their paths diverged, Alex is thrilled they’re set to cross once again on Wednesday. This season only recently became enjoyable again for William, as he struggled to reestablish his game following the stalemate that cost him two months of the schedule. The elder Nylander didn’t play until Dec. 6, and notched only one goal in his first 23 games. Nylander has picked things up in the last week though, tallying five assists in five games while back on a line with Auston Matthews and Andreas Johnsson. Babcock agrees, and thinks the unique opportunity to play against your sibling in the NHL should bring out the best in both Nylanders.